We visited Kapow Noodle Bar in downtown West Palm Beach last night to celebrate National Noodle Month. 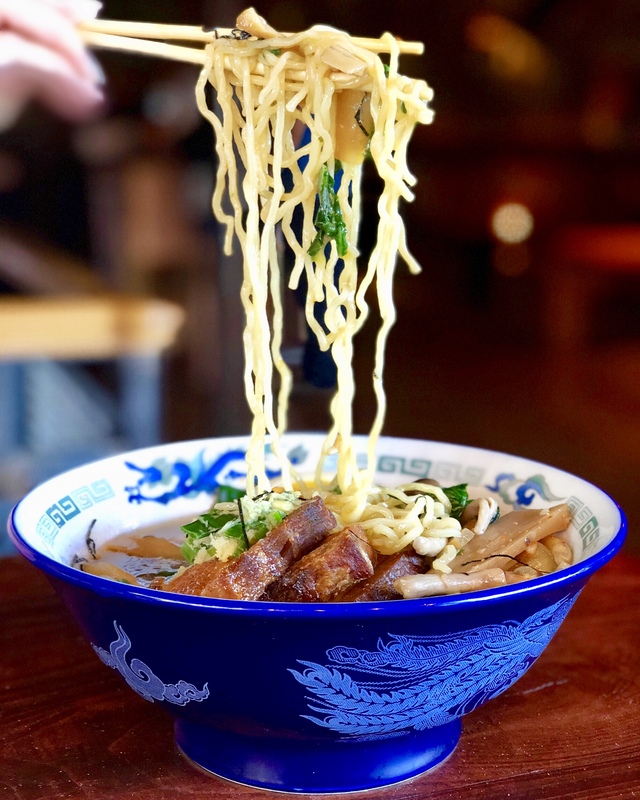 During the month of March, Kapow is offering a Noodle Calendar with daily specials ranging from Lobster Ramen to Duck Pho to Thai Shrimp Pad See Ew. We kicked off the night at the bar with my fave, the Garden Variety. Made with Tito’s Handmade Vodka, Thai basil, lime, fresno, agave and smoked pepper this cocktail has the perfect blend of refreshing herb and citrus and warm heat. Our bartender, Will, was super nice – and surprisingly knowledgeable about noodles! I love the vibe of their bar area and was tempted to stay for dinner, but we moved to an outdoor hightop as it was a nice evening and the opportunity to do so comfortably is rare in South Florida. Mike, the manager, greeted us and then began the parade o’ noods. First we tried the special of the evening, a Wild Mushroom Chow Fun. With a base of wide rice noodles, this Cantonese dish features truffle, mushroom soy, Chinese chives and bok choy. I’ll admit I was hesitant on this one as I’m not a huuge mushroom person, but it was quite delicious and I loved the texture of the noodles and sauce. For dinner, I ordered the Pork Belly Ramen Tonkotsu (which I had literally been thinking about all day in anticipation of dinner). 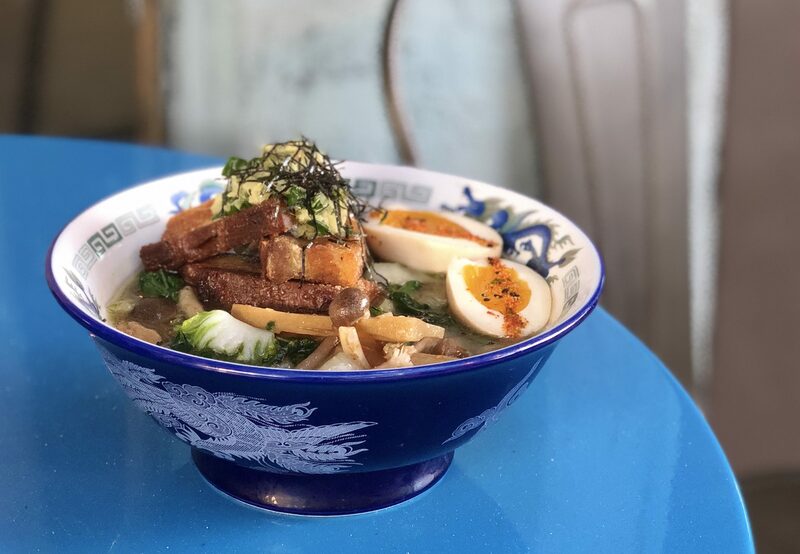 With a fresh wheat noodle base, this blue bowl was piled high above its broth with pork belly, preserved bamboo shoots, Hon Shemeji mushrooms and a six-minute egg nestled to the side. Anyone who has attempted a noodle pull knows it’s not as easy as it looks and we nailed it on the first try with this beauty. I also switched it up and tried the Hungry Duck, made with Aylesbury Duck Vodka, Giffard Ginger of the Indies liqueur, and lime with cantaloupe balls and a stick of lavender. I recommend this drink for two reasons – 1. it was quite tasty and 2. during the month of March it is their #ShakeUp4NKH cocktail benefitting No Kid Hungry in partnership with Taste of the Nation. So it’s cheers-ing for a cause! My dinner date, the lovely Angela Cruz of Discover the Palm Beaches, went with the Saigon Duck Pho. Such a different style noodle dish! With its rice noodles and sweeter broth, the Jurgielewicz Farms duck floated with bean sprouts, Thai basil and lime in a steaming broth. We both agreed we could not overlook the Thai Crab Fried Rice. Simmer down, noodle month! This dish might have been my favorite of the night. A heaping mound of rice hit the table packed with crab, vegetables, egg and cilantro, accompanied with chili and lime. Full disclosure, I took a doggy bag and will be having this for lunch today as well. And just when you thought we were done, Angela told me about the pineapple dessert. The Pineapple Brûlée has to be one of the best ways to end a meal. So light, fresh and perfectly sweet it has a gorgeous sugary crust sprinkled with fleur de sell and topped with toasted coconut. Heavenly. Chef Tim Nicky popped by our table to say hello. I wish it would have been at the end of the meal so I could have fawned over him a bit more. Next time I’ll be ready to sing some praise! If you haven’t been to Kapow, I definitely recommend checking them out for dinner. They also host a killer happy hour during the week with drink and appetizer specials. I haven’t been for brunch yet, but I’m thinking that’ll be on the calendar soon enough.